Asheville's premier horseback riding destination is located on a secluded ranch minutes north of Asheville, North Carolina that has been in the family for three generations. Our picturesque trails pass through the high country, scenic mountain meadows and wooded areas. Fresh mountain air, breath-taking scenery and an old fashioned down-home friendliness greet you when you visit family-owned Sandy Bottom Trail Rides. 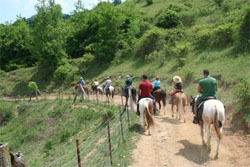 Wolf Laurel Stables offers the most scenic, guided horseback trail and wagon rides in the Asheville area. One of Western North Carolina's best kept secrets, we have over 20 miles of trails, experienced guides, and gentle horses in a beautiful, relaxing environment.